BRAND NEW HOMES have been RELEASED IN THE PREMIER NEIGHBORHOOD IN PARKLAND FLORIDA! This fabulous great room plan offers three bedrooms, including a sumptuous owner's suite, and features a separate dining room. This three-bedroom plan offers separate living and family rooms and the option to convert the den into a fourth bedroom. This two-story home offers plenty of room for today's busy family, with spacious living and family rooms and a second floor offering two bedrooms and a loft. This two-story home offers plenty of flexibility to suit your lifestyle. Four bedrooms, plus a den, family room and bonus room characterize this spacious plan. This plan's first floor is primarily dedicated to living areas, including a large family room, den and a flex room. The owner's suite and three additional bedrooms are located on the second floor. The most spacious home offered, this home features second-story bedrooms and a first floor with family, dining a living rooms, as well as a guest suite. A Florida's BEST Silver Award Winner! Heron Bay offers gracious country club living at its finest! Spanning the highly desirable cities of Coral Springs and Parkland, the community's environmentally conscientious plan balances nature with sophisticated neighborhoods that have earned numerous awards and the distinction of being one of the first golf communities in Florida to be a registered member of Audubon International Cooperative Sanctuary Program. The championship 18-hole TPC golf course is interlaced throughout the community and offers many homes spectacular views. Here is a little information about Parkland, Florida (Broward Counties fastest growing city) the city that we love so much. Hidden away in a Private Parklandish Upscale atmosphere of Broward Counties Northwest corner...steps away from Coral Springs and The Palm Beach County line lives a city that resides safely and quietly with beautiful trees, scenery and safety..Its a forest town and trees predominate on land formerly owned by large cattle ranchers. Parkland's main and only road that runs from one end of Parkland to the other is called Holmberg Road ..2 lanes one either way and no room for any expansion as they like to keep it with the character we saw in the early years of Parkland. 35 miles per hour is the speed and is strictly enforced by our local Police with little other crime to go after..
"I love Parkland because its so private and upscale and its quite rare to see any hustle and bustle of traffic or commercial vehicles we have grown so used to seeing in our every day life." "The Schools are the best I've ever known with all Parkland schools rating *A*"
Parents often tell me "Its like sending our kids to private school but not having to pay we love it." Parkland is the perfect city for a Family friendly lifestyle in a safe, active community.  Parkland's total land area is approx. 10.63 square miles with less than 5% commercial buildings.  With a population of about 21,000 residents with a median age of about 34, 18 and under is approx. 34.7 percent. 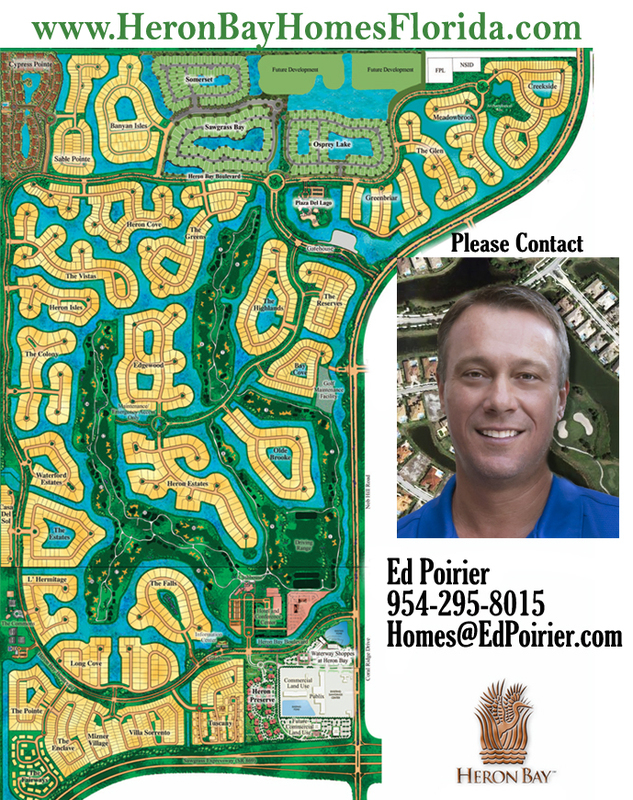 OSPREY LAKE IS THE NEWEST DEVELOPMENT IN HERON BAY - CALL ED BEFORE THEY SELL OUT AS HOME SITES ARE MOVING FAST. Colony: Area of custom homes of one and two story design on larger lots, . Home prices start from about 1 million and go into the middle 2 million range. The community has its own separate gated entrance for extra privacy. Edgewood & Greenbriar: A breathtaking enclave set in the heart of Heron Bay and the TPC golf course. With just 94 estate homes set on oversized lots surrounded by water with two interior lakes, the neighborhood offers an array of dazzling water views. Edgewood provides a marvelous variety of distinguished luxury homes in 19 elevations with designs that feature elegant private entry courts, romantic balconies and spectacular interiors. Some unique features are fabulous master bedroom with private retreat and luxurious bath, gourmet island-kitchen with nook, vaulted ceiling, computer alcove, structured wiring and split-plan garages From the high $800's-to over 1.5 million. Heron Isles : Estate homes built in intimate settings with breathtaking water views or overlooking the TPC golf course. Five spectacular designs include three-car garages, elegant private entry courts, vaulted ceilings, gourmet kitchens with granite countertops, luxurious, master baths with whirlpool Roman tubs, and structured wiring throughout. You'll find 18-inch designer ceramic tile floors in the kitchen, family, foyer, breakfast area and laundry. The neighborhood?s one- and two-story designs range from just over 4,500 square feet of living area to just over 6,200 square feet under air. Prices are from the high $900,000 range to the 1,400,000 range. Reserves : A charming neighborhood of just 67 single-family homes, The Reserves is nestled in its own secluded enclave inside Heron Bay?s new north gated entrance. Distinctive Mediterranean styling and luxurious interior appointments characterize these expertly crafted residences. Choose from five home designs for every lifestyle requirement, including one-and two-story plans offering from 3,200 to 4,600 square feet of living area. Prices range from the upper $600,000's to the mid $900,000 range. The Vistas : The Vistas is one of the most spectacular new neighborhoods in all of Heron Bay. Many of its 89 select home sites offer breathtaking views of the TPC golf course, the waterfront or preserve areas. There are many standard luxury features as well as advanced structural wiring throughout. The neighborhood?s one- and two-story designs range from just over 3,900 square feet of living area to just over 5,700 square feet under air. Prices ranging from the mid$800.000's to the $1,400,000 range.